Site Update: Our Forum Shop Has Been Updated And Some Fixes Have Been Made + New Sale Item! You might have noticed, but our Coin Shop has been updated with a new look, more features, a bugs have been fixed! First of all here is the list of new features! Image slider that showcases sale items and the timeline of the sale! Most items that aren't self explanatory now have detailed descriptions! The color palette of the page has been dramatically improved! The product grid has been fixed so the table is now completely uniform! The cart and checkout information positioning have been fixed! Blok Drop U (Wii U eshop) is now on-sale for just 1,750 WiiWareWave Coins until May 20th! What do you think of the changes/fixes to the Coin Shop? Let us know in our comments below! 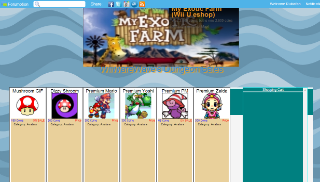 Re: Site Update: Our Forum Shop Has Been Updated And Some Fixes Have Been Made + New Sale Item! Um...the shop looks so nice now. I don't know if you can use PAL download codes in Australia, but our first PAL download code will be added to our Coin Shop today, though the code won't be able to be sent until May 22nd. Well, considering the amount of Coins I have saved, I guess I could at least redeem for the code and try it out; if it doesn't work then I'll give it to one of the European/British members. The code is already available and it's for Turtle Tale which releases on the 3DS eshop next week. There's only one code for "Blok Drop U" left. So if you're interested, you better spend some coins. Edit: Wow! That's a first. A free game in the Coin Shop that isn't even available yet?! SigourneyBeaver wrote: The code is already available and it's for Turtle Tale which releases on the 3DS eshop next week. Thanks for the post lol! I might have to purchase this new reward. It looks like Australia and New Zealand technically form a separate sub-region in terms of eShop codes, so it looks like they won't work. Hm...maybe I should make some contributions to the Coin Shop so us Aussies and Kiwis have some options. @NINTENBRO82 wrote: There's only one code for "Blok Drop U" left. So if you're interested, you better spend some coins. It's available for pre-order, but the code won't be sent until the day the game releases.